Pretty Peacock Productions presents The Aphrodisiacs in “Neon Dreams: Absinthe, A Black Light Cabaret” on August 26 and 27, 2017. The troupe of classically trained dancers presents a brand new black light cabaret to Artistry Honolulu in Kakaako for two nights only. 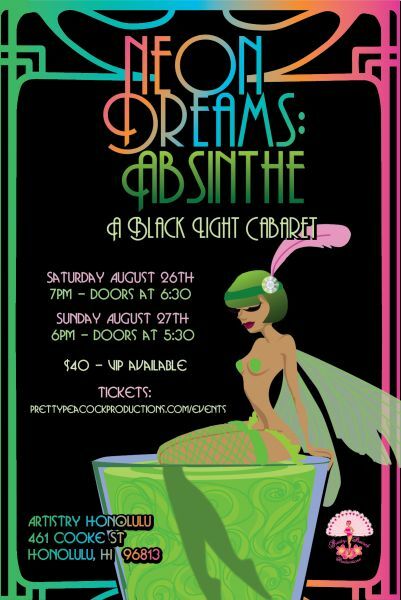 After two wildly successful runs of Neon Dreams (2014, 2015), Pretty Peacock Productions has dreamed up an original new work centered around the favored 1920’s bohemian spirit, Absinthe. In “Neon Dreams: Absinthe,” you’re invited to follow the green fairy into an exotic world of adventure and ultraviolet illusions. Created by Lola Love and Foxy Knoxx with costumes by Rose Wolfe, “Neon Dreams: Absinthe” is a visually stunning show blending cabaret, burlesque, dance and innovative black light puppetry. Set to the live vocal stylings of Foxy Knoxx, alongside special guests Miss Catwings, Serendipity Love, Vila, Rose Wolfe and Lola Love & The Aphrodisiacs. "Every visual image is stunningly created in a neon palette of utter electricity." "If you’re looking for something new, different, strange and just a bit blush-inducing, check out Neon Dreams...The team behind the production...have created something beautiful and unusual that is reminiscent of a Vegas show, but far more intimate...[H]ot, and sometimes haunting, electronic dance numbers." Connect with Neon Dreams: Absinthe!